Rpt last row 14 more times making 16 rows in all. Fasten off. base of 1ch, 1sc in each sc to end, sl st to first sc. Turn. * to * to last 2dc and sc, skip last 2dc and sc, sl st to first sc on beginning of row. Turn. Rpt Pattern Row 18 more times. Turn. 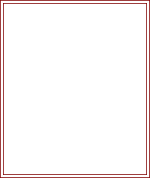 Top - Join in main color, 1ch, 1sc in base of 1ch, 1sc in each sc to end, sl st to first sc. Rpt last row 6 more times. Turn. Rpt last row 5 more times. DNT. one row of crab stitch. Fasten off. in each ch to end. Fasten off. Next Row - 1ch, 1sc in base of 1ch, 1sc in each sc to end. Turn. row end down first side of strap, 3sc in corner, 1sc in each ch along cast on edge, 3sc in corner, 1sc in row end up second side of strap, 1sc in base of 1ch, sl st to first sc. DNT. sides of strap, sl st to first sc on beginning of row. Fasten off. circle with loose thread of yarn, sl st to first sc. DNT. * rpt from * to * to last sc, skip last sc, sl st to first sc on beginning of row. Fasten off. gather top of bag by pulling both sides if drawstring and tie. 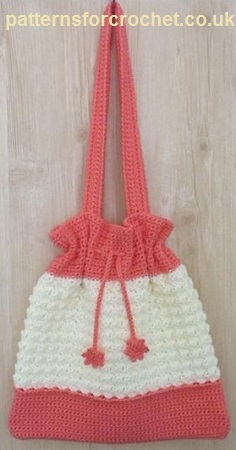 Hope you enjoy this free drawstring bag crochet pattern.